There were 1,049 victims of sterilizations in North Dakota. Of these 1,049 victims, 62% were women. 36% were considered mentally ill, and 60% were deemed “mentally deficient.” In comparison to other states that have sterilization data, North Dakota ranked 12th in total numbers of sterilization. 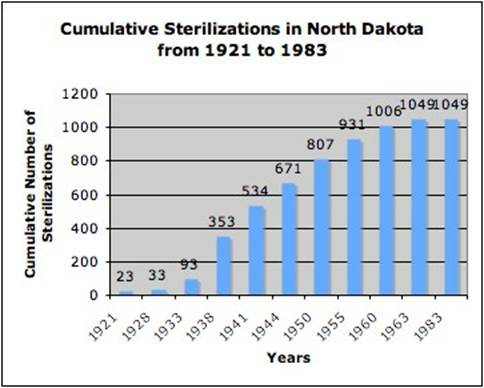 Sterilizations occurred in North Dakota between the 1910s and 1962 (see Paul, p. 639). After the passage of the sterilization law in 1913, sterilizations occurred at a very conservative rate despite compulsory legislation. Up until January of 1930, only 39 sterilizations had been carried out. However, in the Depression years when financial woes took priority over mental institutions, there was a sudden rise in the number of sterilizations. Sterilizations peaked from 1933 to the end of 1943, a total of almost 580 operations were performed. In the early 1950s high figures were reached again, but began to decline late in the decade. North Dakota’s sterilization law was enacted in 1913, after being passed in the House (73 to 20) and the Senate (34 to 4) and being signed into law by Governor L. B. Hanna. It was “an act to prevent procreation of confirmed criminals, insane, idiots, defectives, and rapists; providing for a board of medical examiners and making a provision for carrying out of same” (Laughlin, p. 26). This original version of the law lacked provision for notice, hearing and appeal rights. It was subsequently repealed and replaced in 1927 with a new law that provided notice, hearing, and appeal rights. In 1961, another revision of the law dropped epileptics from the bill. The law was repealed in 1965 (Paul, p. 638). The North Dakota bill was an act to prevent “confirmed criminals,” “insane,” “idiots,” “defectives,” and “rapists” from procreating. Prior to the passage of this law, the Board of Control was set up in 1911 to monitor the state institutions. Once the law was passed in 1913 it became the duty of the State Board of Control to oversee that “effective measures are taken to restrict the procreation of mental defectives” (North Dakota, 62). As set by the Board of Control the ultimate goal was to segregate those whose mental state was too severe to lead a normal life into the state institution, and to sterilize individuals who demonstrated periods of mental disturbance (126). According to the text of the bill, the basis for selection was a procedure: Whenever the warden, superintendent, or head of a state prison, reform school, state school for the feeble-minded, or any state hospital or asylum certified in writing that he or she believes the patient/inmate was likely to give birth to children with criminal tendencies, the condition was not likely to improve, and/or procreation would be potentially detrimental to the community, a surgical sterilization could be brought into question. A board of examiners, appointed by the State Board of Control, consisting of the chief examiner of the institution, the secretary of the state board of health, and one other physician or surgeon would have a meeting in which they would inquire into the mental and physical condition of each inmate and examine the family history of each inmate. After each member of the board wrote up separate findings and there was determined to be a consensus, a tentative operation time would be designated and a surgeon of at least ten years experience within the state would be appointed for the procedure. Institutions were to keep all files of these proceedings and minutes of each meeting were to be written by the chief medical officer. In the event that a patient was to request a sterilization, the physician could complete the surgery without going through the board of examiners. If the state attorney had reason to believe that any person convicted of a felony had been previously convicted of two or more felonies, then the board of examiners would run through the same process as described above (Laughlin, pp. 26-28). Another bill passed at the time defined the feeble-minded as not only those "properly classified" as feeble minded" but also persons "offensive to the public peace or to good morals, and who is a proper subject for classification and discipline in the institution" (Askvig, p. 93). In 1915, this definition was further expanded to include persons "whose defects prevent them from receiving proper training in the public schools" (Askvig, p. 93). The 1927 law provided for the sterilization of the “feeble-minded, insane, epileptic, habitual criminals, and sexual perverts” (Landman, p. 67). This law also gave those approved for sterilization fifteen days to appeal their case. Leaders of various state institutions for the “socially deficient” could recommend sterilization to the State board of examiners, consisting of three surgeons, which could conduct a hearing and make a decision (Landman, p. 67). A further law was defeated in the North Dakota legislature that would have established a state registry for those deemed mentally defective. "All persons with such a designation [were to] be listed in a card catalog in each county clerk's office. This list would then [have been] used to restrict various legal acts, such as land purchases, lawsuits, and most specifically marriage. No person listed in the card catalog would [have been] allowed to purchase a marriage license" (Askvig, p. 94). The central registry was proposed by Dr. Lamont, then superintendent of Grafton (see below), in 1940 (Askvig, p. 20). The state’s motive was deemed by eugenicist Harry Laughlin to have been “mainly eugenic, also therapeutic” (Laughlin, p. 11). During the time period with the most sterilizations (the mid 1920s through the 1930s), an economic Depression sped up the initially conservative rate of sterilizations. The North Dakota Depression started with the collapse of wartime grain prices in 1920. Many farmers had been making large investments and were industrializing their farms in the years immediately preceding the Depression. The Depression effectively “punctured” the financial expansion from the past decades. In 1921, a record number of banks closed which led to many farm foreclosures (Remele, p. 3). These setbacks led to a sharp rise in sterilization operations, likely due to more financial pressure to lower costs in institutions. Many institutions were full and waiting lists were continuing to grow. By sterilizing inmates, those that were only being confined due to potential procreation of genetically “defective” offspring could be allowed to leave, making room for more and/or saving scarce money. Operations after the war years (and the Depression) dropped from the highs of the 1930s with no consistent trend. Another reason for the increase in sterilizations in the late 1920s was an alteration to the 1913 law, which changed from no notice, hearing, or appeal rights to required notice, hearing, and appeal rights. This made anyone who was originally uneasy about the law to be more comfortable, as patients were given more rights. There is little information on the hospital’s population, which makes it hard to determine the definitive groups targeted. However, from the overall numbers of sterilizations it is clear that women and those classified as “mentally deficient” were overrepresented in the sterilization numbers. Over 62% were women, an overrepresentation of approximately 12%. Over 60% were “mentally deficient,” nearly double the number classified as “mentally ill.” There is no known information about race, ethnic, or religious sterilization numbers. It is possible that North Dakota overrepresented Native Americans (particularly women) like its southern border state, South Dakota. There is no information on restrictions on those identified in the law or with disabilities in general related to abortion, marriage, et cetera. There is little information available about major proponents of eugenics in North Dakota. It is known that once a Social Service Department had been established at the State Institute of the Feebleminded in Grafton (see below) in 1929, which among other things was responsible for the suvervision of discharged and paroled residents there, the two heads, Henrietta Safley and Evelyn Jonston became promotors of eugenic sterilizations (Askvig, pp. 18-29). During the peak period of sterilizations from 1933-1938, Dr. James P. Alylen was the superintendent at Grafton (see below). Although the law could have applied to the numerous institutions that were under the control of the Control Board, it seems that only two of them utilized the sterilization law. The main institution to report operations was the Institution for the Feeble-Minded in Grafton, North Dakota (see Paul, p. 636), as it was the main institution for the feeble-minded and the majority of sterilizations were done on this group. Over 60% of sterilizations in North Dakota were done at this institution (634 out of a cumulative 1,049 up to January of 1964) (Paul, p. 636). 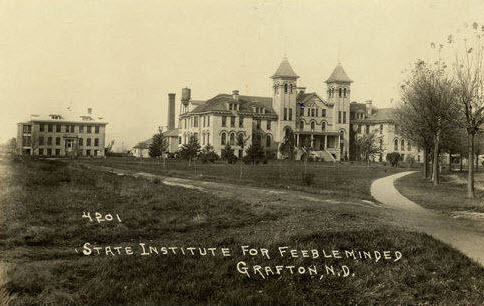 It later changed its name to Grafton State School and then North Dakota Developmental Center, and it may close in the next few years.The institutional history One Hundred Years addresses sterilization at the institution (Askvig, pp. 18-21). 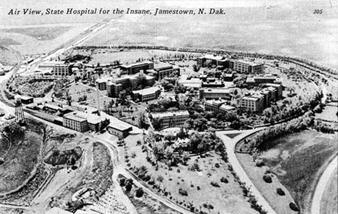 The Hospital for the Insane in Jamestown, North Dakota, was run by Dr. Wm. M. Hotchkiss at the time of the initial sterilization law. In this hospital many of the early sterilizations happened. According to a Dr. Hotchkiss, the hospital was short-staffed and under-budgeted, slowing the process. “I have had no difficulty in securing the consent of parent or relative when patient refuses to have the operation performed…[yet] we have done much less [i.e., fewer operations] than contemplated, because the lack of finance prevented the hiring off surgical nurses” (Laughlin, p. 87). This was said in March of 1918, before the new State Board of Administration came into office. According to the next superintendent, the new State Board of Administration was opposed to eugenic sterilization and many relatives were opposing it, which led to a halt of sterilizations at the hospital. An article written in 1999 on the institution mentioned that there were sterilizations even before a state sterilization law: “In 1914, the hospital began to routinely sterilize its 'inmates,' due to the common belief that their 'deficient and degenerate mentality' would be handed down to any progeny. Sterilization was carried out on female patients for many years” (Cole). 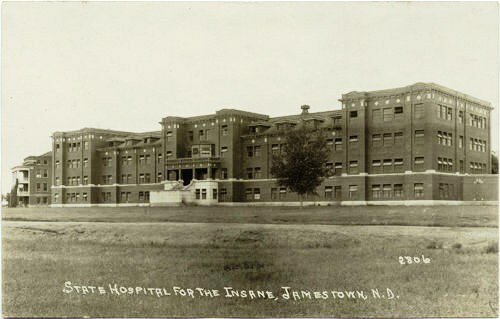 Since being known as the State Hospital for the Insane, it has also been known as the Jamestown State Hospital and the North Dakota State Hospital (Asylum Projects). By 1997 the state had appropriated money to turn some of the institution's buildings into a part of the James River Correctional Center, a medium-security prison located at 2521 Circle Drive in Jamestown, North Dakota. This is its current state today. The James River Correctional Center website does not mention the sterilizations in its history section. There is little information on opposition to the sterilizations in North Dakota. It is clear from the fact that sterilizations were very conservative in the initial decade after the 1913 law was passed that there was public and individual uncertainty about the sanctity of the law. Although some superintendents were adamantly pro-sterilization, there were many who were less active and more cautious about the sterilization selection procedure and actually completing the operations. It is also clear that during times of economic downturn and financial pressures, people became less likely to question the sterilizations. Most sterilizations were done during the Depression era, when people cared less about those in institutions and more about feeding their own families. When it became difficult to feed, clothe, and house their own, the interests of those who contributed relatively less to society were put below their own. Askvig, Brent A. 2004. One Hundred Years: The History and Chronology of the North Dakota Developmental Center. Minot: North American Heritage Press. Asylum Projects Reserve Preteritus. “Jamestown State Hospital.” Available at http://www.asylumprojects.org/index.php?title=Jamestown_State_Hospital (last accessed 2/28/11). Cole, Janell. 1999. “N.D. State Hospital's History Marked by Politics.” In-Forum Fargo-Moorhead (October 24). Available at <http:// www.in-forum.com/specials/century/jan3/week44.html>. Landman, J. H. 1932. Human Sterilization: The History of the Sexual Sterilization Movement. New York: MacMillan. Laughlin, Harry H. 1922. Eugenical Sterilization in the United States. Chicago: Municipal Court of Chicago. North Dakota Developmental Center. “Developmental Center Accreditation, Certification, and Background information.” Available at <http://www.nd.gov/dhs/locations/developmental/accreditation/index.html>. North Dakota Board of Control of State Institutions. 1914. Biennial Report. Devil’s Lake: Journal Publishing. Available at < http://books.google.com/books?id=83QbAQAAIAAJ&printsec=frontcover&source=gbs_ge_summary_r&cad=0#v=onepage&q&f=false>. Paul, Julius. 1965. “‘Three Generations of Imbeciles are Enough’; State Eugenic Sterilization Laws in American Thought and Practice.” Washington, D.C.: Walter Reed Army Institute of Research. Remele, Larry. 1988. “North Dakota History: Overview and Summary.” Available at <http:// www.nd.gov/hist/ndhist.htm#bibliography>.